Get your SWAMI XP2 today and realize the potential of the most personalized diet plan available! December is such a tricky month. It is probably the busiest of the year, between year end planning, holiday prep, shopping, parties and cooking. It’s also the month that, more than any other, beckons us to look inward as the days grow shorter. As I’ve grown older, I’ve found that shifting my ideas and notions about the holidays, particularly gift giving, has been quite liberating and ultimately enriching. The shift occurred as I moved from “presents to presence.” I began to value my time in the moment, truly being with the people I love and experiencing them rather than producing the perfect holiday gift or item. Cultivating this quality doesn’t cost anything and doesn’t involve going anywhere; rather it requires us to be still and breathe. Sounds simple, right? Not so! We are programmed to get things done, to multitask, to produce. Being present is a different mindset entirely, and one that is so rarely fostered in our society today. This December, join me in sharing your presence in the world. It’ll take as few as ten minutes a day, though you could certainly indulge it for far longer, and it’s as simple as following these three steps. Take a seat. Find a quiet place, where you can sit, spine straight, feet on the floor, hands gently resting on your thighs. Drop your shoulders down away from your ears. Find a point about 6 feet in front of you on the floor to focus on and gaze downward. You can, if need be, close your eyes to help. Feel your breath. Breathe in and out, becoming more and more aware of the rhythm of your breathing. Feel the cool air as it enters your nostrils and the warmth of it as you exhale. As thoughts come up, notice them, acknowledge them and release them. There’s no need to linger on each thought. Simply notice them and release. Come back to the breath. As you sit, your thoughts may grow more “loud,” whether they wander to the things you need to do, physical discomfort, your worries or the people that you love. For this short time, release them and come back to the breath, in and out. I used to think that in order to meditate or quiet my mind, I had to have the perfect environment with dim lights, candles, and silence. More times than not, because I didn’t have this type of environment available, I chose to not meditate at all. Don’t make that mistake. By following these simple steps, finding your breath can actually happen nearly anywhere. By practicing this skill, you'll soon find yourself more present around your family, friends, coworkers, and the world can better experience you as the unique, one-of-a-kind individual that you are. Enjoy the month, and on behalf of Peter, myself and all of us at D’Adamo Personalized Nutrition, I wish you a joyous and fully present holiday season. Last month we discussed secretor status, a companion piece to the Blood Type Diet that gives users a more focused look into their genetic makeup so their diet can be pinpointed even further. But it is not the last word in personalization. 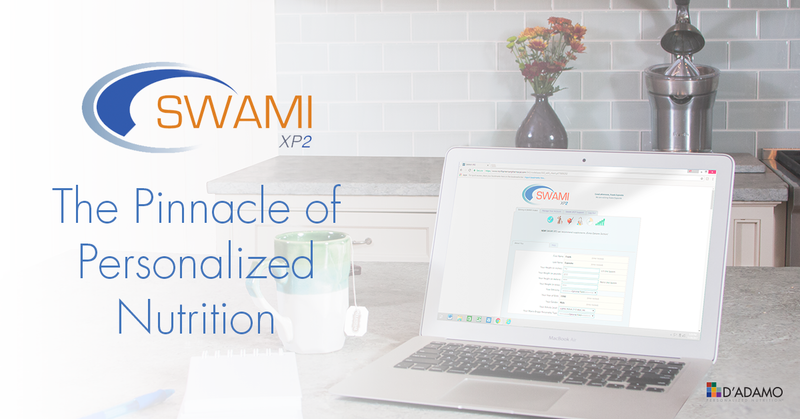 For those who want to experience the ultimate in personalized nutrition or people who are still battling chronic conditions, Dr. Peter D’Adamo created SWAMI XP2 software, the latest version of SWAMI Xpress. Though many of our loyal followers have heard of SWAMI, some get its role confused. SWAMI is not a software version of either the the Blood Type Diet or the GenoType Diet. SWAMI stands on its own as an individual protocol to be followed independently. 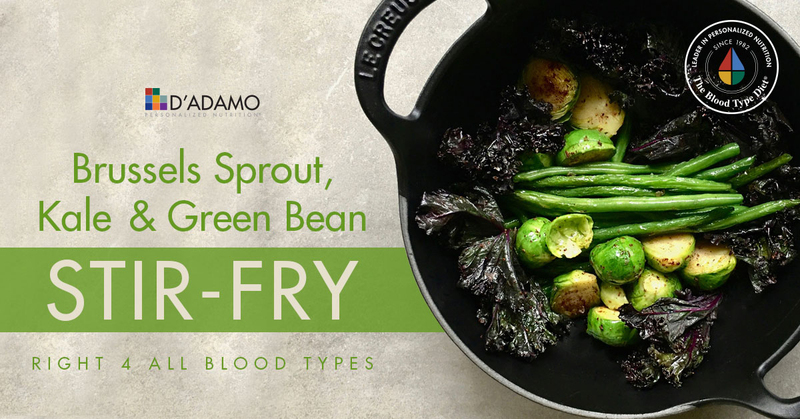 It is based on the founding principles of the Blood Type Diet and the GenoType Diet and thus integrates much of the same data into its calculations. But it goes so much further than that. You will need some information to get started with SWAMI. The full list of what you need to begin is available as a checklist on the SWAMI product page. SWAMI is simple to get up and running, as it is a web-based platform with nothing to install. As soon as you buy it from our store, you will receive an email directing you to www.swamixpress.com that includes a one-time login and password along with your permanent account number. Once you have the email, you can log in to SWAMI and begin inputting your information and measurements. 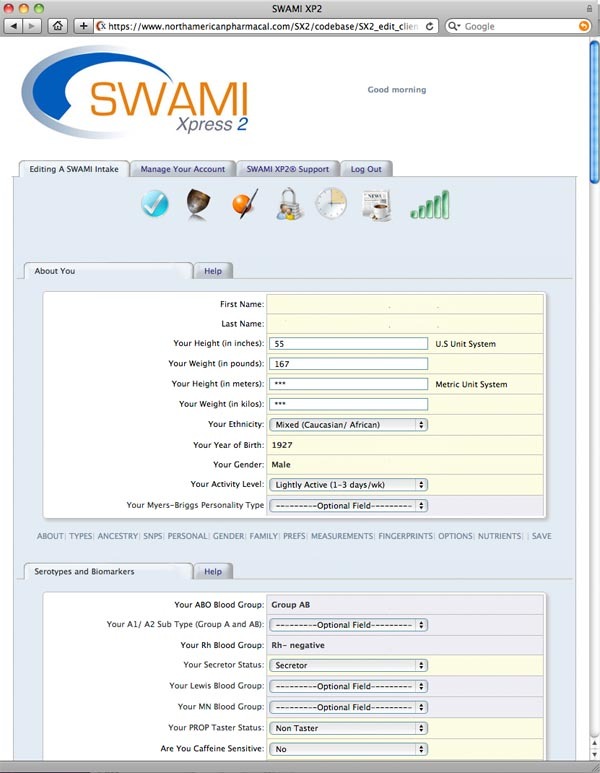 There is a downloadable user manual and individual help tabs that will guide you through the various SWAMI Intake steps. 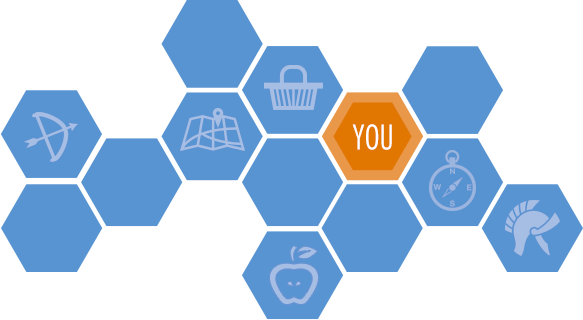 SWAMI offers Special Preferences and Nutrient Filter adjustments like Kosher and gluten elimination if you have pre-existing dietary needs, so it will factor that into its calculations. The customization levels at your fingertips will allow you to not only hone your diet to very particular goals, but let you adjust your Intake entries as needed. After inputting all your data and personal needs, SWAMI will work its magic and give you a treasure trove of personal information the likes of which you have never seen before. As soon as all your required data is saved, you will be given a 40-50 page diet report that you can save on your computer or print. The SWAMI Xpress Diet Report is an invaluable source of knowledge that takes all your individual needs into account. The first ten pages or so will explain introductory material as well as some of the determinations SWAMI has made about your personal needs. One piece of information it will give you that may be familiar to you is your GenoType, which indicates Hunter, Gatherer, Teacher, Explorer, Warrior or Nomad. While this is based on the GenoType Diet book by Dr. D’Adamo some food values will be different than those listed in the GenoType book because SWAMI has added much more data and calculations to the mix to give you an even more personalized look at what is best for your body. So though a certain food may be right for a Warrior in the GenoType book, it may be different for you in SWAMI. Think of the GenoType categories as black and white, while SWAMI includes all the shades of gray between them. After these initial categorizations, the next 30-40 pages of the SWAMI report are focused on food. It is by far the most valuable resource you will have during your diet. As you can see, SWAMI gives you a huge amount of information on each food group. At the top of the page you can see the optimal portion size for you as well as the amount of servings you should have of this food per week. It then breaks down each food into three categories. Similar to the Beneficial, Neutral and Avoid trifecta that you know from the Blood Type Diet, Superfoods, Neutrals and Best Avoided are the ways SWAMI categorizes foods. 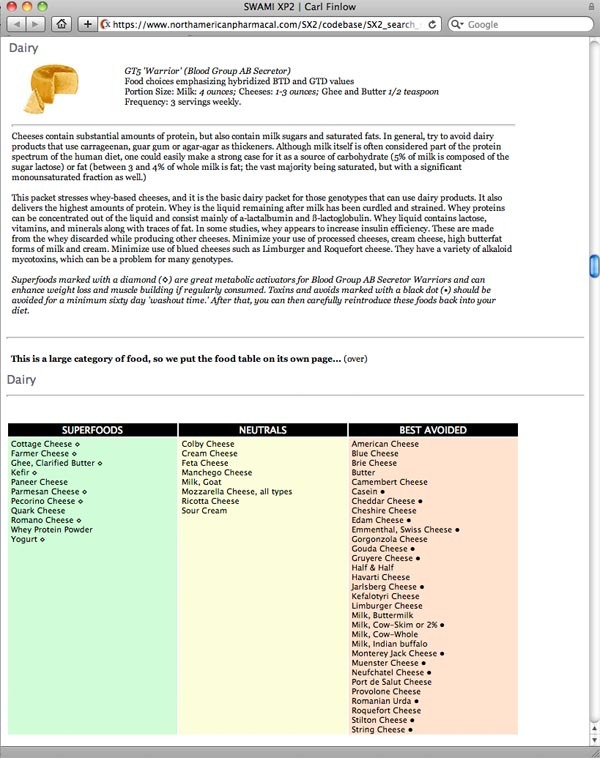 Imagine having this personalized wealth of information for every major food category! That is the brilliant personalized diet SWAMI will provide for you. If you are interested in learning about SWAMI’s other incredible features like its meal planner tool and cookbook creator, read more about it! of the most personalized diet plan available! 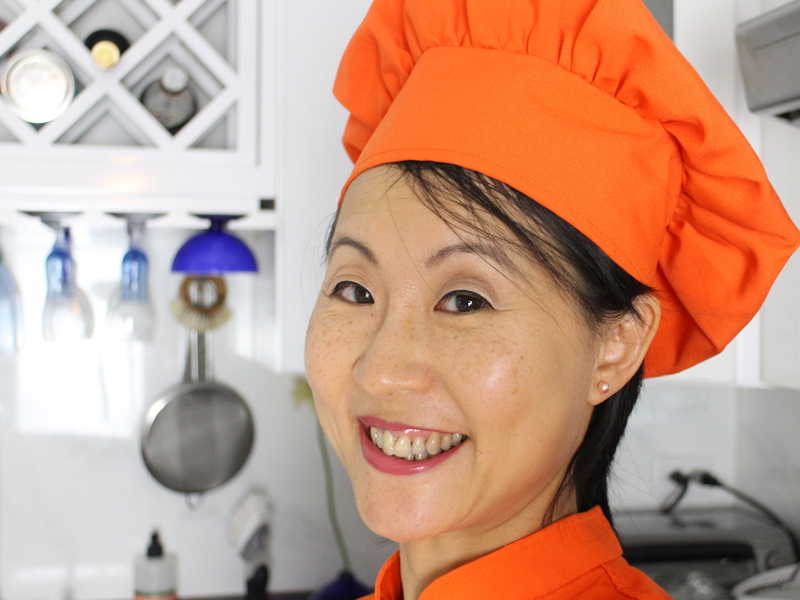 This month’s testimonial is a special Q&A with long-term Blood Type Dieter and blogger Louisa Wah. 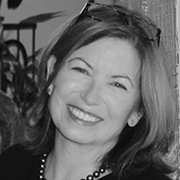 She has been a friend of D’Adamo Personalized Nutrition for years and has followed all of Dr. D’Adamo’s protocols, starting with the Blood Type Diet and ending with SWAMI XP2, which she is using currently. Read all about her journey! Billionaire.com wrote about Justin Gelband, the star trainer who helps many A-List Victoria's Secret models look their best! In their words, "He is a big fan of the blood-group diet made famous by Dr Peter D'Adamo." Cosmopolitan also talked with Justin Gelband and conducted a full interview where he again touted the benefits of the Blood Type Diet, which he puts his "angels" on while they train for their big moment on the runway! The National Examiner discussed The Blood Type Diet and showed a basic overview of the concept with main do’s and don’ts for each type. The winter holidays call for comfort and a lot of excessive eating and feasting! Fear not, it is easy to enliven your table with healthy seasonal dishes that will add color and a festive note to your holidays. Brussels sprouts are the star of the show this winter. They are packed in vitamins and fiber, can be eaten shredded raw in a slaw, grilled, stir-fried or steamed! We like to keep some of that flavor and crunch and stir-fry them with green beans and red kale. This dish is versatile, can be enjoyed with some rice or as a side dish to your mains. 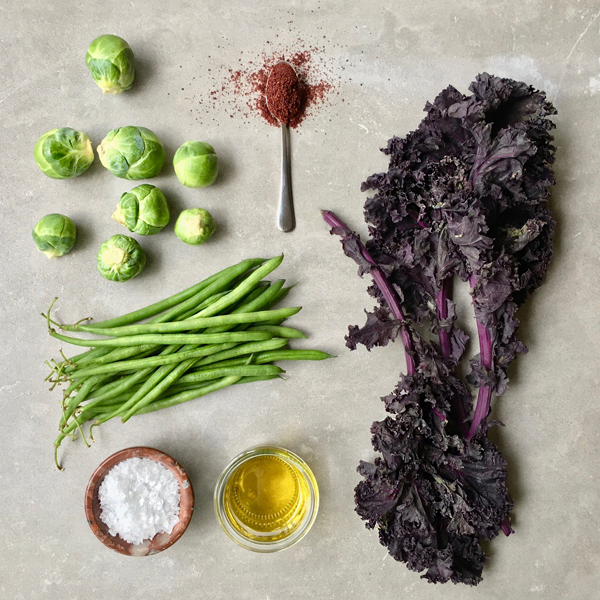 * Blood type O non-secretor can swap brussels sprouts with broccoli for a superbeneficial! Add the Brussels sprouts with a little salt and the sumac and stir vigorously for about 5 minutes. Add the green beans and keep stirring for another 4-5 minutes. Transfer to a serving dish. In the same pan, add another tablespoon of olive oil. Add the kale leaves with some salt and stir until they crisp up. Add them to the vegetables.